As with most things with ACI, we have a tremendous amount of flexibility in the configuration options to meet different requirements. In this post, we’ll explore options that allow multiple Tenants to use a common, shared L3Out (routing table) for the entire fabric (as opposed to using a L3OUT per VRF). Only non-overlapping IP addresses can be leaked between tenants. Subnets leaked from multiple consumer networks, which are leaked into a shared VRF, must be unique and cannot overlap. Contracts for shared service must have the scope set to Global. The default scope is VRF and will not work for shared services. APIC release 1.1.3 or later is required for Option 2 if dynamic routing is required. Prior to 1.1.3, you could only use static routing with option 2. As of APIC release 1.2, shared services can be performed with a shared subnet defined under the bridge domain (BD). Prior to this, shared services required that the provider subnet be defined under the EPG that was to be shared. BD in Common tenant: Configure a shared L3 out for the fabric with static/dynamic routing (iBGP/OSPF/EIGRP) in Tenant Common. This option implies that all Endpoint groups (EPGs) are configured in respective user Tenant(s), while the Bridge Domains (BDs), subnets, and VRFs are all configured in the Tenant common where the L3out is configured. BD in User tenant: Configure a shared L3 out for the fabric with static/dynamic routing in Tenant Common. This option implies that all Endpoint groups (EPGs), Bridge Domains (BDs), and subnets are configured within the customer’s respective user Tenant(s), while the VRF is configured in the Tenant common where the L3out is configured. 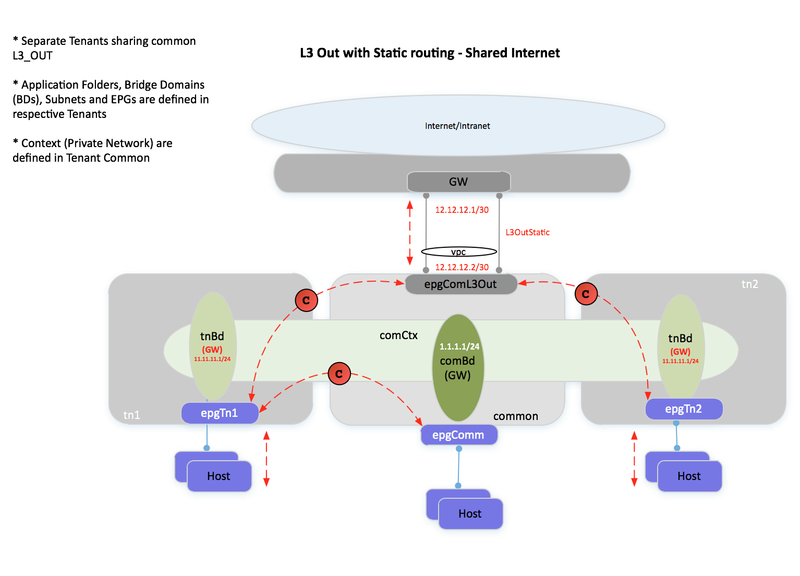 Inter-VRF Leaking with Shared L3out: Configure a shared L3out for the fabric with static/dynamic routing in Tenant Common. This option implies that all Endpoint groups (EPGs), Bridge Domains (BDs), subnets and VRFs are configured within the customer’s respective user Tenant(s), while only L3out is configured in the common tenant. Create a VRF, bridge domains, subnets and L3Out in the common tenant. Create endpoint groups (EPGs) in individual tenant spaces. Static and/or Dynamic routing can be used on the L3out. In this configuration, tenants share the same VRF and cannot have overlapping IP addresses. Since BDs and subnets are part of common tenant, the all subnets are visible to all tenants. In this case, all subnets are centrally located, and do not need to be configured or allocated everytime an EPG is created or deleted. Configure the Application Profile(s) under each user Tenant. Create a VRF and L3Out in the common tenant. Create bridge domains and endpoint groups in individual tenant spaces. 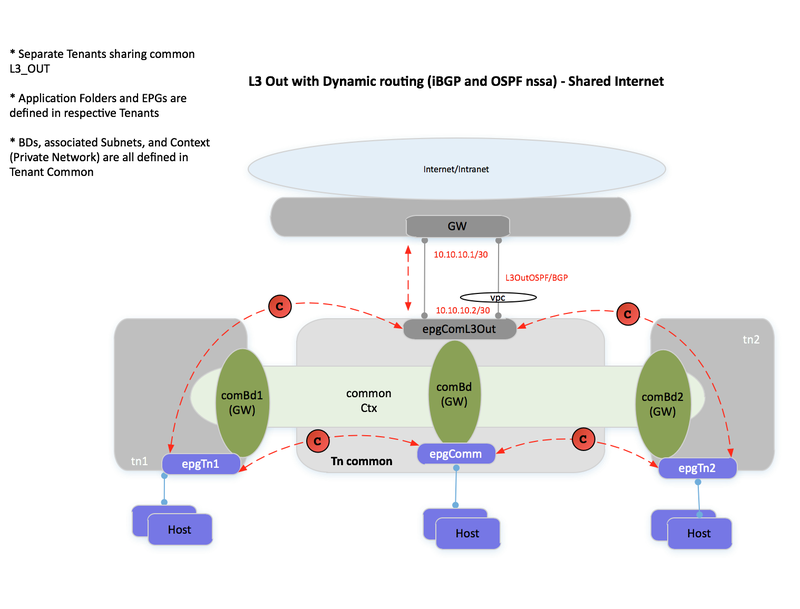 Static and/or Dynamic routing can be used on the L3out from release 1.1.3 and later. Only static peering was allowed before 1.1.3. In this configuration, tenants share the same VRF and cannot have overlapping IP addresses. The bridge domain with the subnets are configured under the individual tenant spaces and are not visible to other tenants. Create separate tenants with separate VRFs, bridge domains, and endpoint group. Each tenant has its own VRF and can use overlapping IP addresses. A contract is exported from the tenant that is providing the shared service (tenant common in our case). Route leaking between VRFs is performed to provide connectivity between the consumer and provider. This option is supported from 1.2 onwards. Configure your VRF, Bridge Domains (BDs) and subnets under each user Tenant. Associate Bridge Domains (BDs) with the VRF in User tenants. Consume the contract from Tenant Common (this can be done via a VzAny/vrf-level consume, via consuming the contract on a per-EPG basis, or by consuming a contract interface). Create a contract (in the common Tenant) for each Tenant. This contract should have a global scope. Configure L3 outside connection under Tenant common and associate it with the VRF in tenant common. Below we will now configure L3Outs in common tenant for different options. Option 1 –BD in Common tenant. As seen below, this design will allow us to have multiple user Tenants share a common L3 Out, which is located in Tenant common. The main benefit for this design is that all Tenants on the fabric do not need a separate L3 out. The Endpoint groups (EPGs) are configured inside of each of the respective Tenants, as usual. However, the Bridge Domains (BDs), the subnets, and the shared VRF are defined in Tenant common. Shared VRF instance (Shared Routing table) – All Tenants not using their own, individual L3 Out would need to use a common routing table. This implies that all IP addresses for all Tenants would need to be unique and cannot overlap. At least one interface on the fabric must be up and operational for the Endpoint group (EPG) which is associated with the Bridge Domain (BD). Option 2 –BD in User tenant. As seen below, this design will allow us to have multiple tenants share a common L3 Out, which is located in Tenant common. The main benefit for this design is that all Tenants on the fabric do not need a separate L3 out. The Endpoint groups (EPGs), Bridge domains (BDs), and subnets are configured inside of the respective user Tenant, as usual. However, the shared VRF is defined in Tenant common. Option 3 – Inter-VRF Leaking with Shared L3out. The use-case for this type of design is multi-tenant fabric, with Tenants that are fully self-contained, but have the ability to share an external connection, such as access to the DC network, or internet routes. With this design, you could have X number of Tenants, in theory, and you would not need to configure an L3out for all of them; you could just share the L3out from Tenant Common (as long as IP addresses do not overlap). In the diagram below, you will see that the VMs in each respective Tenants have the ability to communicate with hosts outside of the ACI fabric via the shared L3out. The 9.9.9.1 and 9.9.9.2 addresses represent networks learned from our shared, L3out. Shared between VRFs – To leak the subnets to common tenant. NOTE – There is no associated L3out listed on the BD; when we use an Inter-vrf Shared L3out, we do not need to associate the user Tenant BDs with the L3out in Tenant Common. If you had a Tenant-specific L3out, it would still be associated to your BDs in your respective Tenants. Moving into our Common Tenant, we will need to define a Shared contract for our L3 services. This contract will need to have a scope of Global. Our contract, ‘SharedL3’ is providing the contract to allow any-to-any communication. From our L3out, we will need to provide the SharedL3 contract that we previously created. This contract will be consumed in our user Tenants and is required to allow the routes to be leaked from our Common Tenant to the user Tenants. Next, we will create an external EPG for your L3out. This EPG (or L3EPG) refers to external IP prefixes coming in on the L3out. In this example, we are allowing all subnets into the external EPG with 0.0.0.0/0 route as below. Shared Route Control Subnet – This indicates that this network, if learned from the outside through this VRF, can be leaked to the other VRFs (if they have a contract with this external EPG). It is used for route leaking to other tenants (Tenant1 and Tenant2 in this case). This subnet type is similar to ‘export route control’ with one exception: the Aggregate Shared Routes option applies to any subnet, not just the 0.0.0.0/0 subnet. For example, if you configure subnet 192.168.0.0/16 with the aggregate shared routes option, this matches the 192.168.0.0/16 subnet and all 192.168.0.0 subnets with longer prefix lengths. This is equivalent to configuring an IP prefix-list with the le 32 keyword (less than or equal to). Shared Security Import Subnet – sets the classifier for the subnets in the VRF where the routes are advertised. Shared security-import subnets are used with shared L3Out configuration, not used for routing control. This setting configures an ACL in the VRF that is consuming the shared L3Out. Next, from Tenant1, we will configure a VzAny contract which will consume the ‘SharedL3’ contract at the VRF level. In our case, for simplicity, we have configured vzany contract, but the same could be established by consuming regular contracts for EPG (since the provider is in common) or we could use ‘Consumed Contract Interface’ (if the provider is not in common tenant but rather is in another user created shared tenant). Tenant2 will also be configured with VzAny consuming the ‘SharedL3’ contract from Tenant Common at the VRF level. In our case, for simplicity, we have configured vzany but the same could be established by consuming regular contracts for EPG (since the provider is in common) or we could use ‘Consumed Contract Interface’ (if the provider is not in common tenant but rather is in another user created shared tenant). Now that we have configured our Inter-VRF Shared L3out, we will perform a few pings from VMs inside of each respective Tenant to validate that the configuration is working. A ping test from a VM in Tenant2 shows that it can reach networks behind the Shared L3out. The 9.9.9.0/24 network is only reachable via the Shared L3out from Tenant Common. Below are the highlighted (RED) routes from the ACI Border leaves (the common:default VRF, the Tenant1 VRF, and the Tenant2 VRF. In addition, we will show the VRF specific routing tables on our external Nexus 7K. 0/0 (default route) is originating from Nexus 7K towards the ACI border leafs. I note you say that for a *shared* L3-Out EPG (aka l3extInstP) the user tenant EPG must use a VRF (aka context) in tenant common. I am still searching for a configuration procedure that makes this possible.